The central theme for this chapter was triggered from the story Vaikuntam narrated about the official surveyor of the All India Handicraft Board (AIHB) stumbled upon Vaikuntam’s father’s sister selling idols at a temple in Vemulawada. 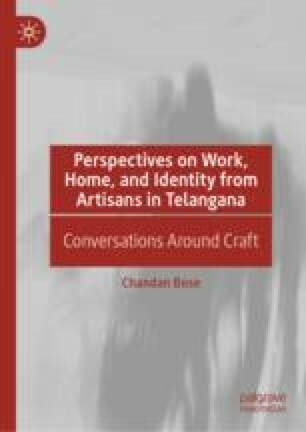 But more than the incident itself, it is the way in which Vaikuntam narrates the events that makes it seem, as we have discussed in the previous chapter, that the craft was almost in a way ‘discovered’ by the state. Bandhapadhyay, Kishnendu. 2016. Baluchari Tangled in GI Tussle. The Times of India, February 11. Available at http://timesofindia.indiatimes.com/city/kolkata/Baluchari-tangled-in-GI-tussle/articleshow/50952487.cms. Geographical Indications Registry. 2010a. 190—Examination Report—25-02-2010. Available at http://ipindiaservices.gov.in/GI_DOC/190/190%20-%20Examination%20Report%20-%2025-02-2010.pdf. Geographical Indications Registry. 2010b. 190—Reply to Examination Report—02-05-2010. Available at http://ipindiaservices.gov.in/GI_DOC/190/190%20-%20Reply%20to%20Examination%20Report%20-%2002-05-2010.pdf. Geographical Indications Registry. 2010c. 190—Statement of Case—20-11-2009. Available at http://ipindiaservices.gov.in/GI_DOC/190/190%20-%20Statement%20of%20Case%20-%2020-11-2009.pdf. Iqbal, Iftekar. 2015. Protection of Jamdani. The Daily Star, March 8. Available at http://www.thedailystar.net/protection-of-jamdani-33014. World Intellectual Property Organization. 2004. Geographical Indication: An Introduction. Available at http://www.wipo.int/publications/en/details.jsp?id=272. World Trade Organization. 2004. Exploring the Linkage Between the Domestic Policy Environment and International Trade. Available at http://www.wto.org/english/res_e/booksp_e/anrep_e/world_trade_report04_e.pdf. Accessed 24 May 2016.